Day Excursion to Tea Plantation. Receive a warm welcome post-breakfast. 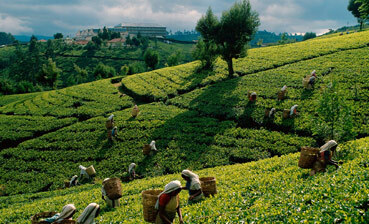 Travel to the famous tree plantation factory poised on the emerald hills of Sri Lanka. Pluck some tea leaves - ‘two leaves and a bud’ with the local tea pluckers. The expert tea pluckers will help you to find out these signature tea leaves from the rest and then plucking these tender buds with precision and speed. These signature tea leaves are then sent to processing. Travel with your self-plucked tea leaves to the factory and explore this fine art of tea-processing. Witness the process of transformation of the bright green tea leaves to the black, brown and green tea at the tea estate. Brew your self-plucked and processed tea. Taste the some grading samples in the end.